Manchester United defender Gabriel Heinze insists he wants to fight for his place at Old Trafford - at least until the end of the season. The 28-year-old has fallen down the pecking order this season, with Patrice Evra often preferred at left-back. "I know the interest from AC Milan for me but now the decision remains with United," Heinze told the Daily Star. "I have a contract signed until June 2007 and I do not want to go anywhere. I do not want to be sold in January." 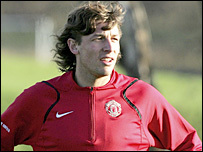 Heinze joined United from Paris Saint-Germain for £6.9m in 2004, but he has made only 17 first-team appearances this season. After an impressive first season in the Premiership, Heinze missed seven months of last term with a serious knee injury. The Argentina international will be available on a free transfer at the end of the season. "I want to wait until June to see what happens," added Heinze. "I am happy in Manchester with my work and I want to try and get back in the team, but it is the coach who picks the 11. "My relationship with Sir Alex Ferguson is normal, like any other player." Heinze has also been the subject of reported interest from Tottenham, but Spurs boss Martin Jol has said the club will not be pursuing him. United have been repeatedly linked with an interest in Southampton youngster Gareth Bale, another left-back.